"Millions of dollars are pouring into our country by way of grants and infrastructure investments because of the hard work of President Rody Duterte," Secretary Martin Andanar said. DAVAO CITY, March 17 (PNA) -- The Australian government has approved additional funds amounting to AUD40 million for peace initiatives in the Philippines. The amount is beside the funding assistance for the Education Pathways for Peace in Mindanao (PATHWAYS), which will be implemented in Bangsamoro areas with a grant of AUD90 million. The additional AUD40 million funding was announced Friday by Australian Foreign Minister Julie Bishop during the launching of the PATHWAYS project at the Marco Polo Hotel here. Bishop said the additional fund will help the government of the Philippines in its peace initiatives in the next six years. 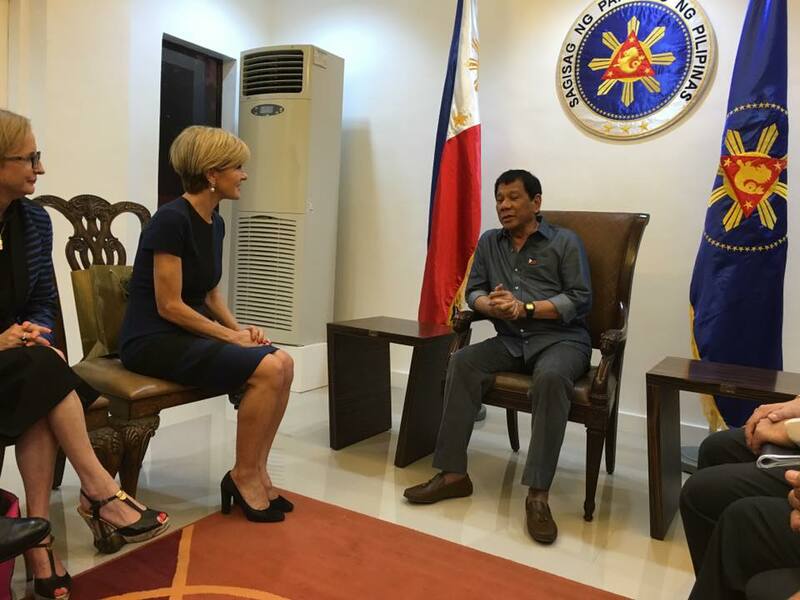 “Australia continues to be the partner of the Philippines,” Bishop said. Presidential Peace Adviser Jesus Dureza was thankful for the additional assistance as this would help the government implement projects not only in the Bangsamoro but also in other conflict-affected areas in the Philippines. Dureza cited the aid is timely because they are now initiating discussions of establishing a new facility named Mindanao Peace and Development Trust Fund, which will cover all areas affected by armed-conflicts. Dureza revealed that the National Democratic Front (NDF) will also be forming a committee to work on short and medium-term development strategies for insurgency-affected areas. The committee will be headed by NDF consultant Luis Jalandoni, while Dureza will sit for the Office of the Presidential Adviser on the Peace Process (OPAPP). The NDF and OPAPP will work as managers for the project implementing team. Dureza noted the NDF agreed to the value of doing development projects while peace negotiations are ongoing. He said the funds that the Australian government will bring in for the peace process can be managed through the Mindanao Peace and Development Trust Fund. In an interview on the sidelines of the launching, Nigel Bruce, First Secretary of the Australian Embassy, said the projects that will be covered by the AUD40 million fund will still be discussed with the Philippine government through OPAPP. Bruce said the Australian government had just approved the funds to support the peace process in the Philippines. Improving conditions for peace and stability is one of the Australian Aid (AusAid) programs in the Philippines. For 2015-16, the Australian Official Development Assistance to the Philippines was estimated at AUD84 million (PHP3 billion). Australia is a consistent contributor to the Mindanao Multi-Donor Trust Fund to support economic and social recovery and promote effective governance in conflict areas. Among the programs funded by AusAid is the two-year Building Autonomous and Sustainable Institutions and Communities in the Bangsamoro (BASIC), which helps improve the capacity of institutions and support the role of women in peace building, among others.